Knowledge Graphs are becoming more common within industrial and scientific applications. Field experience with our customers have revealed that existing graph visualization and querying tools fail to adequately support users in understanding and querying real-world datasets. 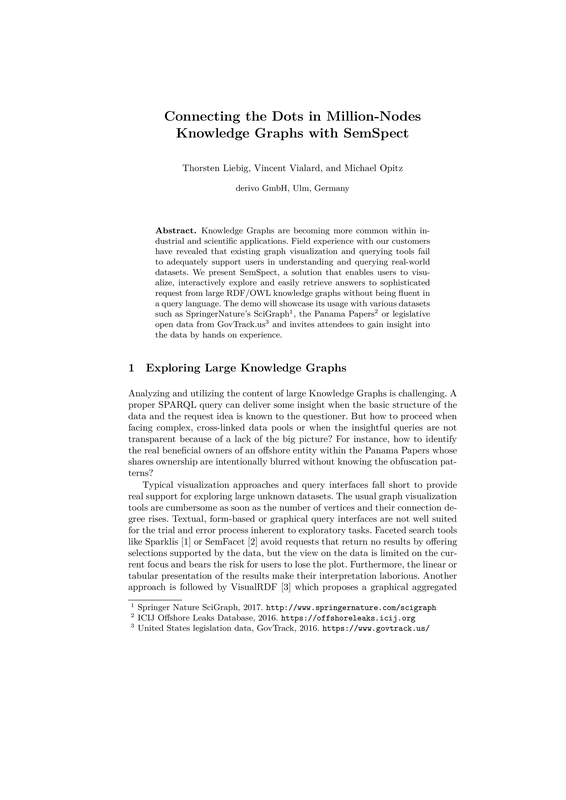 We present SemSpect, a solution that enables users to visualize, interactively explore and easily retrieve answers to sophisticated request from large RDF/OWL knowledge graphs without being fluent in a query language. The demo will showcase its usage with various datasets such as SpringerNature's SciGraph, the Panama Papers or legislative open data from GovTrack.us and invites attendees to gain insight into the data by hands on experience.